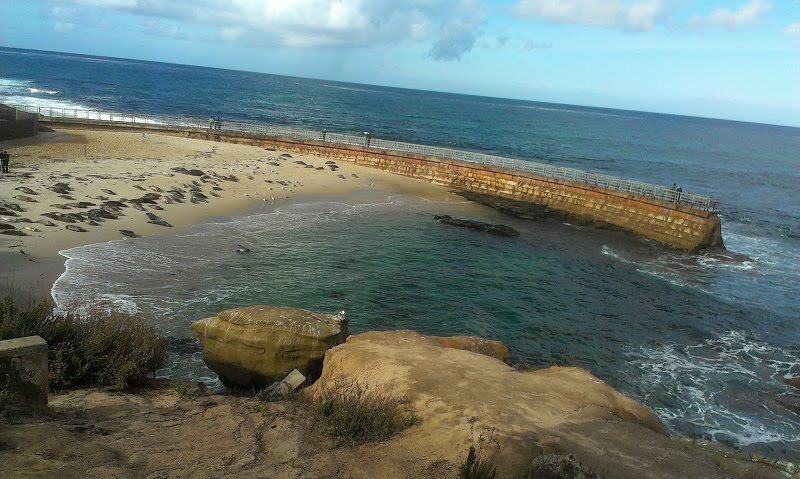 Near downtown La Jolla is the Children’s Pool, a small beach protected from ocean waves by a sea wall. The wall was built in 1931 to create a calm area of water for swimming. Today the Children’s Pool is the center of a battle between those wishing to see it refurbished and preserved as a swimming area and those that advocate for protection of the harbor seals that have established a home at the Children’s Pool in the past two decades. The debate continues, with the current compromise including a yellow rope to separate humans from seals, at least during the pupping season for the seals which lasts from mid-January to mid-April. The gathering of seals has become a minor tourist attraction and on the day I visited on December 26th parking spots nearby were in high demand despite overcast weather and a light rain falling. 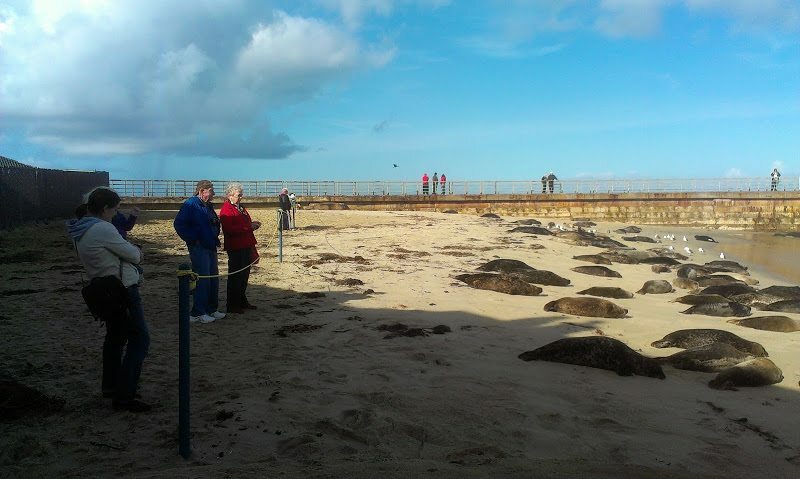 The rope barrier allows visitors to come within feet of the seals, or to view them from atop the sea wall or from the sidewalk along Coast Boulevard to the east. (Swimming and diving is still allowed and I saw two divers leave from the Children’s Pool during our visit.) Being so close to the seals, which can weigh up to 290 pounds, is an experience not often found outside of zoo walls. On my visit there were roughly 100 seals on the beach, although 200 have been counted at other times. 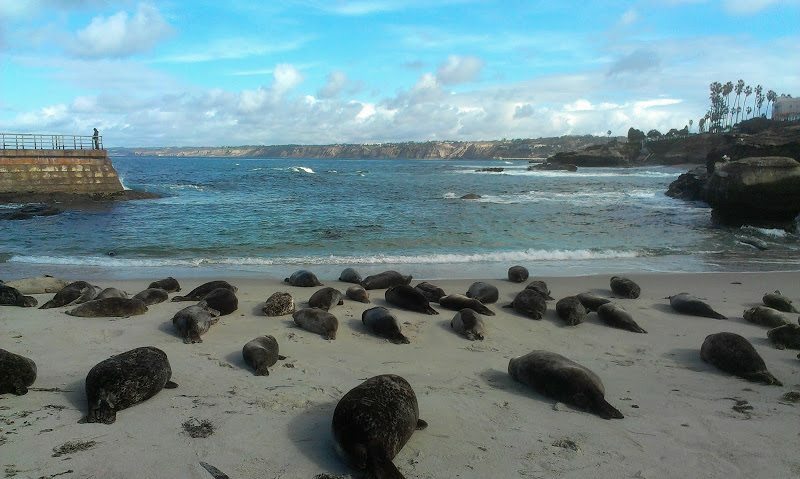 Combining the proximity, along with the number of seals, is an experience that is very unique. (Their fuzzy cuteness may have something to do with the feeling as well). The opportunity to visit these kind of sights is the kind of amazing experience that is often taken for granted in San Diego, because it’s always available and therefore not a top priority for a resident. When something is always present, there is less need to take advantage. It will ‘always’ be there. I sincerely hope that this assumption proves to be true for the seals, and the other natural wonders in San Diego. Just north of the Children’s Pool is the Ellen Browning Scripps Park. 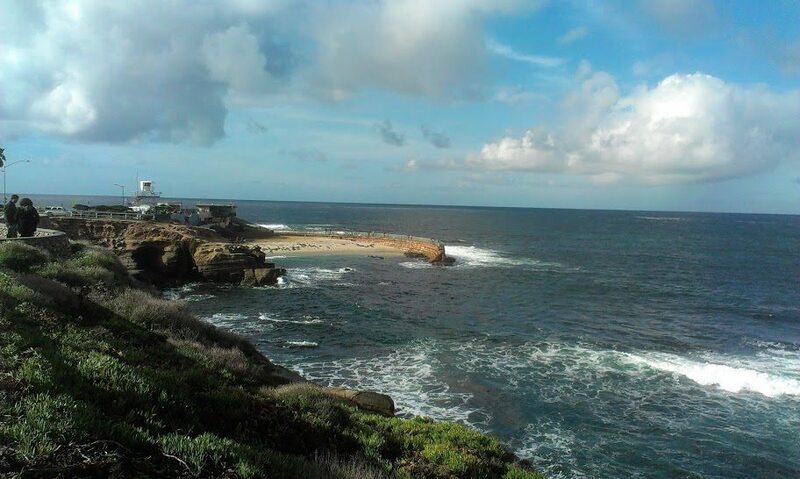 This park is higher above the ocean and provides views north of La Jolla Shores and onward to Torrey Pines. There are typically a large number of pigeons and sea gulls in the park and a large grassy area with picnic tables. The park is named after an early philanthropist in San Diego, who also paid for the construction of the Children’s Pool sea wall. The park is a nice place for a picnic. In the final days of 2012 best wishes to you for a fulfilling end to the year and for health and happiness in 2013. « The Fright Wing: Why So-Called Conservatives Get So Wild and Crazy. Pretty good description of Children’s Pool. It is indeed a great place to visit. I would ask to correct a common misconception. The lawsuit to restore the Pool for children and swimming was over in 2009. There is only a question of whether the beach must be closed to the public or we can share with the seals. Everybody likes seals, except they attract lunatics and lawyers. You are absolutely correct that pupping season for harbor seals here is mid January to Mid April. The City ropes off the beach from Dec 15 to May 15 because animal rights activists mislead a committee long ago. But the rope is not a legal barrier. It is entirely “advisory”. Seals are actually seasonal with great quantities in winter and spring and some days none in summer. I and others swim with the seals year round. I can give you pictures or videos of them coming to me for tummy rubs. John – thanks for clarifying. I would love to see your photos. My email is john.patrick.anderson@gmail.com if you’d still like to share. Have a great weekend and NYE!